I have more energy and am motivated to keep pushing towards my 50lb goal! 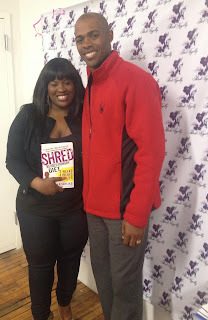 I was a huge fan of his Fat Smash Diet, as it helped me lose 15lbs and 2 dress sizes before I moved to Chicago and started packing on the pounds. He now has a new 6 week revolutionary diet program: SHRED that is getting rave reviews! I've looked over the book, heard success stories and after getting tips from him on how to stay on track am excited to start the program! Plan – If you find out ahead of time what restaurants you will be stopping by check out the menu online and decide what you will order. Once you get to the restaurant pass on appetizers and DO NOT LOOK at the menu! You will only be further tempted. If you have breakfast offered at your hotel, soon as you check in ask the front desk what’s on the menu so you will be well prepared when morning rises. For my Weight Watchers plan I will pick a meal, count the points and record them in my tracker before arriving. For a diet like SHRED you are already given a meal plan to stick to so I’ve found restaurants that carry those options and will plan to purchase foods at a local market to keep in my room. Skip the socializing – I know it will be hard but eating alone is sometime the only way to stay on track! When I am eating with a group of people, I tend to get caught up in the conversation and do a lot of “mindless” eating and drinking. Before I know it I’ve ate half the bowl of chips and salsa! No bueno! Exercise –Pack your gym shoes and plan to workout on your trip! Even if your hotel doesn’t have a fitness center there are options. a) Bring workout DVDs to play on your laptop b) Download workouts on your smartphone or tablet c) Go for a walk outside. For this trip I will be using the fitness center and bringing my Pilates DVD! When I travel I always workout in the morning since I generally have long days for business travel. Find the time that works best for your schedule and stick to it! Be Determined! Being away from home may cause a disruption in our normal routine but that doesn’t mean you have to throw your diet out the window. Implement a new plan and stay focused on your goals to guarantee your success! So, how do you stick to your healthy routine while traveling? Great advice! I also pack a small immersion blender that is very portable. That way I can turn juice, fruit and pre-packed protein powder into a smoothie for my 4th meal in the room. I try to get a room with a fridge and microwave too and that helps with heating up soups and staying on the Shred plan. I'm so jealous you met Dr. Ian in person! I have packed blenders before too! Great idea I forgot to include! Dr. Ian was very nice, personable and has so much knowledge and passion for wellness.